Supporting information, images, and links for an article on libraries and postage stamps by Larry T. Nix for the Library & Information History Group Newsletter (a special group of the Chartered Institute of Library and Information Professionals [CILIP] of the United Kingdom for Summer 2010. Although the collection of postage stamps related libraries can be approached on very simplistic basis, the role that postage stamps have played in the larger culture is a legitimate topic for serious study. On September 30-October 1, 2010, the National Postal Museum (U.S.) in conjunction with the American Philatelic Society and the American Philatelic Research Library will be conducting a major symposium on “Stamps and the Mail: Imagery, Icons, & Identity”. The presentations and supporting research for this symposium offer a possible approach to a more serious look a libraries and postage stamps. I have extensive information about postage stamps and other postal items related to libraries and archives on my Library History Buff website located at http://www.libraryhistorybuff.com/ . I will provide links to more specific pages of interest below. I also publish the Library History Buff Blog at http://libraryhistorybuff.blogspot.com/ where I often use postal items to illustrate entries. I wrote about how I became interested in bibliophilately and postal librariana in an article http://blogs.ala.org/AL100.php?title=how_an_article_in_american_libraries_sav&more=1&c=1&tb=1&pb=1 for the blog created by the American Libraries magazine to celebrate its centennial. Introduction to bibliophilately with information on others who have contributed to the study of this topic. Bibliophilatelists work hard to identify their topic on postage stamps. The Dag Hammarskjold Library of the United Nations in New York appears on more postage stamps than any other library because it is often included on stamps showing the the United Nations complex. The Library is the building at the bottom of the stamp below. Often when libraries appear on postage stamps it is because the stamp is actually commemorating an institution or an architect and not the library. That is the case with the Low Memorial Library of Columbia University (seen below) which has appeared on stamps commemorating major university anniversaries. 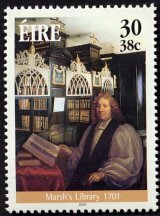 Sometimes a library appears on a postage stamp as background for prominent individuals. Ajman issued a stamp honoring Winston Churchill in 1966 which included the British Museum (when it included what is now the British Library). Ajman only issued stamps between 1964 and 1972. Many of these stamps were printed to sale to stamp collectors and were not actually used for postage. 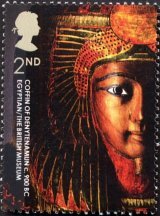 The British Museum was honored on a set of stamps issued by the Royal Mail in 2003 on its 250th anniversary. 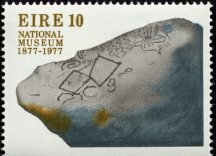 The stamps featured artifacts from the Museum. One of the stamps is shown below. 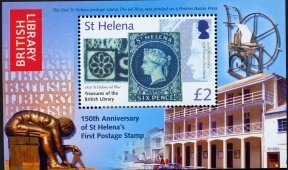 This souvenir sheet was included as part of the St. Helena set which also included six additional postage stamps. 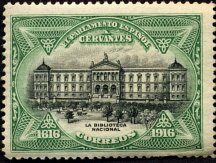 The National Library of Spain was featured on two 1916 official stamp issued by Spain. They were part of a set of stamps referred to as the Cervantes issue. This stamp of the Library of Congress was issued by the United States during National Library in 1982 on April 21. This stamp was issued buy the United States on April 24, 2000 to commemorate the bicentennial of the Library of Congress. This stamp showing the Library of Parliament building in Ottawa, Canada was issued by Canada in 1930. The building has appeared on several Canadian postage stamps. The building itself was built in 1876 and escaped a disastrous fire in 1916 which destroyed other Parliamentary buildings. 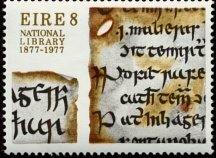 Ireland commemorated the 100th anniversary of the National Library and the National Museum with stamps in 1977. 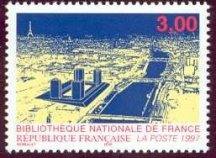 The unusual new building of France's Bibliotheque Nationale appeared on a postage stamp issued by France in 1996. The National Library of China was honored on two stamps to celebrate its centennial in 2009. 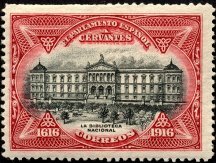 The Library of the Catholic University of Louvain in Belgium which was destroyed in World War I appears on a stamp issued in 1915, perhaps the earliest library postage stamp. More on Louvain’s libraries and postage stamps can be found on this web page. 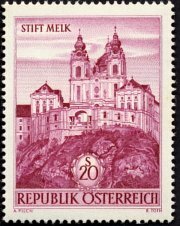 Austria’s Melk Abbey which includes a magnificent library appears on three postage stamps including this one issued in 1963. 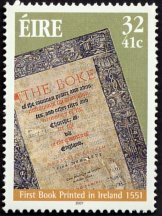 Also in 2001 Ireland issued a stamp featuring the Common Book of Prayer, the first book printed in Ireland on the 450th anniversary of its printing.